THE powerful bomb packed in a small briefcase that exploded near Gate Number 5 of the Delhi High Court on Wednesday morning, killing 12 people and injuring scores of others, shows the continuing fragility of our systems in preventing terror attacks. Prime Minister Manmohan Singh’s just concluded two-day visit to Bangladesh will be remembered for giving a new direction to India’s relations with Bangladesh. The last minute jolt given by West Bengal Chief Minister Mamta Banerjee’s withdrawal from his entourage over the Teesta river water issue did affect the outcome of the visit but only to a limited extent. WHEN the system is corrupt, even a well-meaning scheme can become a money-making racket. A classic example of this malady has come to light in Punjab. The Pollution Control Board has found that 70 per cent vehicle pollution checking centres in the state are not equipped with the requisite testing instruments and have been merrily issuing fake pollution under control (PUC) certificates to vehicle owners. THE military success of the Libyan rebels and the establishment of the Transitional National Council (TNC) throw a question mark at the decision of India — and Russia, China and Brazil — to abstain from voting for UN Security Council resolution 1973, which, on March 17, authorised Western military intervention in the Libyan civil war and the imposition of a no-fly zone over Libya. Geographically, the crow flight distance between South Block and NDMC's concave-spherical building on Sansad Marg, which housed CWG Organising Committee, may have been merely 3 km, yet the two stood poles apart. THE Green Revolution in Punjab was the outcome of a variety of factors. Obviously, the basic research innovation emerged from new strains of wheat and rice followed by a higher use of fertilizers, pesticides and water; standardisation of agronomic practices; and need-based mechanisation for uniformity of farm operations. IT is high time we realised the importance of agricultural research in broader and long-term perspective. The state governments, commission agents, agro-processing industry, traders particularly exporters and farmers are the major beneficiaries of such institutional research. THE powerful bomb packed in a small briefcase that exploded near Gate Number 5 of the Delhi High Court on Wednesday morning, killing 12 people and injuring scores of others, shows the continuing fragility of our systems in preventing terror attacks. That barely four months ago a low-intensity bomb had gone off in the same court’s parking lot near Gate Number 7 and much action was intended to stave off any future attack but little was actually done is testimony to the lackadaisical approach that characterizes our reaction to terror. There was neither any CCTV camera at the gate to record the goings-on nor any metal detector to check entry. Both these devices were in the pipeline but not yet in operation. With Delhi not having seen a major terror attack for nearly three years, there was evidently a sense of complacency and a smug confidence that the striking power of terrorists was much reduced as mistakenly surmised from the failed attempt at the High Court in May. There is, of course, the inevitable question of who did it. A large number of terror outfits have emerged in recent years, many of which are fronts for larger ones. If an E-mail message by one Harkat-ul-Jihad member is to be believed, it was this outfit that perpetrated the attack. There is much talk of strengthening the intelligence network but it is a moot question as to how much our intelligence has been able to penetrate and unmask such outfits. Crucially, in 2009, Home Minister Chidambaram had announced an imaginative security architecture. This included NATGRID, a networked intelligence database, the National Counter-Terrorism Centre which was slated to be a nodal agency for all counter-terror efforts, and a National Investigative Agency. While the NIA is looking into the High Court blast, the other two are yet to take off. What also needs to be looked into is whether we have adequate deterrent in our law to keep terrorists at bay. Considering that it takes years, nay decades, for conviction, the death penalty handed out in the rarest of rare cases to the likes of the killers of Rajiv Gandhi and the kingpin in the attack on Parliament, Afzal Guru, is still in question. What message that sends out is clear as crystal. Prime Minister Manmohan Singh’s just concluded two-day visit to Bangladesh will be remembered for giving a new direction to India’s relations with Bangladesh. The last minute jolt given by West Bengal Chief Minister Mamta Banerjee’s withdrawal from his entourage over the Teesta river water issue did affect the outcome of the visit but only to a limited extent. The agreement that could have been signed over the sharing of river waters was put on hold. This led to Dhaka refusing to grant transit rights to India through Bangladeshi territory. But the two sides agreed to go ahead on the rest of the issues. It has been agreed upon that no country would allow the use of its territory to spread terrorism on either side of the border. This may lead to an extradition treaty between India and Bangladesh in the near future to work as a deterrent for extremists even when there is a change in political dispensation. The two countries will now have a clearly demarcated land boundary with an agreement on some undemarcated areas, territories under adverse possession and the exchange of 162 enclaves (51 in Bangladesh and 111 in India). No country was able to properly administer these areas, where the residents would find themselves in virtually a “no-man’s land”. Despite the mood of despondency in Dhaka, Bangladesh has found an opportunity to improve its balance of trade, which has always been in favour of India. A major trade concession has been granted to Bangladesh by India allowing duty-free access to 61 items from the other side. As many as 46 of these items belong to the textiles sector and these have a ready market in India because of their cost-effectiveness. India has also allowed 24-hour access to Bangladeshis through the Tin Bigha corridor. The policy of give and take adopted by the two countries may encourage other countries in South Asia to think on these lines for promoting peace, progress and stability in the region. WHEN the system is corrupt, even a well-meaning scheme can become a money-making racket. A classic example of this malady has come to light in Punjab. The Pollution Control Board has found that 70 per cent vehicle pollution checking centres in the state are not equipped with the requisite testing instruments and have been merrily issuing fake pollution under control (PUC) certificates to vehicle owners. The scheme was inaugurated some years ago with a lot of fanfare following the havoc played by smoke-spewing vehicles which had made lives of other road users and those living in nearby areas hell. Only those vehicles which carried certificates that their emission was within permitted limits were to be allowed to ply on roads. The scheme worked properly for some time and then the legendary corruption set in. Policemen virtually stopped checking the certificates – unless they wanted to make an extra buck on the sly. At the same time, the checking centres started issuing fake certificates in a perfunctory manner. Pollution remained; corruption became worse. Vehicle owners had to shell out up to Rs 50 for a service which was never provided to them. Unfortunately, the story is not peculiar to Punjab. The same thing has been happening all over the country — barring a few metropolitan cities. In Punjab, air quality is not up to national standards, particularly in Ludhiana, Gobindgarh, Jalandhar and Amritsar. The pollution board has said that it will ask the district transport officers to cancel the authorisation of defaulting vehicular pollution checking centres and file an FIR against the centres which were found issuing fake certificates. But what about the officials who allowed these centres to run with impunity for so long? It is they who are actually responsible for all this mess. Along with India, the opposition by Russia and China, permanent members of the Security Council, to the resolution, was tempered by their refraining from using their veto powers against the Western-sponsored resolution. That implied that they did not want to break with the West over Libya. The question now is whether the fall of Gaddafi will lead them to rethink their approach towards other autocratic Arab leaders. The overthrow of a dictator is always applauded by those who welcome democracy. But as the toppling of Gaddafi by Libyan rebels is being hailed, especially by Britain and France, who engineered NATO’s intervention in what was essentially a civil war, one can see in it a fight for Western interests and the triumph of Western values. India, Russia and China were right to be cautiouspartly because the UN Security resolution was unclear about how the measures it outlined would improve the situation in Libya. Also, the idea that the West can overthrow any ruler it dislikes in the name of humanitarianism flouts international norms and helps imperialism, not humanitarian ideals. Britain and France ignored calls by the African Union, which certainly has a stronger interest in Libya, and the Arab world, for a ceasefire, giving the impression that might is right. In any case, China, India and Russia had little reason to get involved in Libya. Indian oil companies have interests in Libyan oil, but India evacuated most of its 18, 000 citizens in Libya. China relied last year on Libya for only 3 per cent of its crude imports. But it did have to evacuate more than 30,000 workers employed by mostly state-owned Chinese companies earlier this year. The US itself stayed out of the Anglo-French initiative to begin with, and made clear that it would make no troop commitments. The US only called on Gaddafi to quit when there seemed a reasonable chance that the rebels might win. Still recovering from the mess of Iraq, and bogged down in Afghanistan, the US is reluctant to get militarily embroiled in more Muslim-majority countries. Generally, Washington’s calculations in West Asia have been no less pragmatic than those of India, Russia and China. The US initially supported the governments of Presidents Hosni Mubarak of Egypt and President Bashar at Assad of Syria; and it only turned against them when it became clear that they were too weak to hold out against the growing tide of popular unrest. Gaddafi’s opponents now face the formidable task of assembling a government forging stability in a country riven by tribal rifts. Gaddafi’s overthrow does not ensure the stability or democracy in Libya; the rebels are too divided to promise that. Miffed at the lack of support from India, Russia and China to their cause, the rebels might be reluctant to do business as usual with them. But Western countries, especially France, are keen to have India on board, and President Nicolas Sarkozy invited India along with China and Russia to the Paris conference on Libya on September 1 to discuss support for the TNC. That could serve two purposes. Having them on board would dispel any impression in the Arab world that the Anglo-French action an act of Western imperialism (The Syrian rebels do not want Western aid). The Libyan rebels have to build a new state. They must bring about reconciliation between warring factions; deliver essential services, including water, electricity, food and fuel. They must forge a united leadership that serves as a government-in-waiting. The TNC has to move from the rebel capital of Benghazi in eastern Libya to the national capital in Tripoli to establish control of the country and to give it political leadership and direction. The fight for greater political freedom and economic choice is likely to be protracted and bloody, and the transition towards more open societies messy. In a region in which the struggle to get rid of the yoke of dictatorship faces the constant threat of sectarian and tribal strife, the question is whether and what India, with its myriad ethnic and religious groups cohabiting in a democracy and its long-standing ties to parts of West Asia. can offer. That is certainly true in Libya where 42 years of Gaddafi’s rule blocked the emergence of institutions that could question or challenge his authority. The TNC and its elected successor will need vision and substantial popular support to build a more open, transparent society from scratch. Iraq, which was torn by sectarian violence and fratricide after Saddam Hussein’s fall in 2003, was an example of how not to unite a warring country. The TNC seems to have learned the lessons. With the help of the United Nations, it plans the political transition to democracy. The idea seems to be that the UN could support the establishment of an inclusive and legitimate interim government, and help it prepare for the election of a provisional national congress to draft a constitution in the next six to nine months, as well as procedures to ensure that the process is transparent. India’s cautious stance on Libya has been well considered. The UN-backed process should make it easier for India to come to terms with the new political dispensation in Libya, which offers India an opportunity to demonstrate that it is on the side of democracy. At the same India, China and Russia — like the US — have shown that each issue involving support to those who want an end to Arab dictatorships must be judged on its merits. Geographically, the crow flight distance between South Block and NDMC's concave-spherical building on Sansad Marg, which housed CWG Organising Committee, may have been merely 3 km, yet the two stood poles apart. During my last assignment in the Army, I sat on the second floor of the South Block. Most of the office-bearers in this part of the building were in the Twilight Zone of their careers. The environment was rather officious and bureaucratic. On one occasion, compliments by a budding scribe, comparing our wing to an old age home, had to be swallowed with a pinch of salt. A few months before the D Day, some senior officers were inducted to fast track the Games preparations and I happened to be one among them. On a bright sunny afternoon, as I entered the colourful building of the CWG, it felt as if one was amidst an annual college fete. There were hundreds of young people, median age under 25. Most were fresh graduates, techno-savvy, bright with a quick uptake. They appeared highly motivated and proud to be part of the great sporting event. Despite the lack of 'games time experience' coupled with hazy higher direction, these fertile minds innovated and improvised to formulate sound operational plans, which later proved vital for the efficient conduct of the Games. They toiled hard during the test events, learning the tricks of trade, hands on. The greenhorns showed remarkable patience and fortitude when ridiculed and scoffed by self-proclaimed sports pundits. When the charges of corruption and mismanagement made headlines on the eve of the Games, the Young Brigade was deeply disillusioned. Displaying immense maturity, they insulated themselves to remain focussed on the mission. Closer to the mega event, as cohesive teams along with volunteers, they moved into the venues to finetune last-minute preparations, while defying the constraints of poor logistics backup, including substandard meals. Come Games time, the Young Turks were off to a flying start, surprising their detractors. The Spartans were at the respective stadiums at the crack of dawn and remained on their toes till late into the night, providing excellent services with a smile. Their spirited motto was “not to ask reason why, but to just do and die”. This phenomenon continued through the fortnight and the young pioneers stood their ground with a degree of professionalism and elan, earning appreciation from one and all. Some 20,000 youth who came from all corners of the country were the true face of the resurging India. These were the unsung heroes of successful CWG 2010 and part of the positive story. 'No nonsense, plain speaking lot', they were impatient to make best of the day. Once the job was done, they went their ways, without seeking any recognition or credit, leaving behind a rich legacy of intense nationalism and patriotism. Today, the young India has once again pitched in, but for a different mission; to rid the prevailing system of the deadly virus of corruption. Their screams echo the same familiar sentiments: 'Come what may, we will rise to the occasion so that India keeps its date with destiny'. As a consequence of such efforts, a spectacular increase in crop yields, expansion of cultivated area, rising cropping intensity, shift in the crop pattern etc together led to an exemplary rise in production, particularly food grains in Punjab. The small state, apart from feeding the ever-growing population, generated a mountain of food grain surpluses by contributing 30 per cent rice and 60 per cent of wheat to the national pool. In other words, with just 1.5 per cent of the geographical area and 2.3 per cent of the population of the nation, it is contributing about 12 per cent to the national output of food grains. From these facts, one can safely infer that but for such progress in this high-potential state, at least 10 per cent of the population of other states would have either faced a serious hunger situation or we would have to search for food with a heavy import bill. However, the implication of such a fast agricultural growth was that the state was engulfed in a number of environmental problems. Heavy drain on water resources, rapidly exhausting soil health in terms of major and micro-nutrients, increasing pest resistance, falling bio-diversity, problems of crop residue management, a fast influx of labour from other states and declining work culture with the local population and over-investment in farm machinery have created doubts about the sustainability of the existing agricultural production system. Even the 33.5 per cent (10469 KWH) of the electricity consumption in Punjab diverted for agriculture free of cost in 2009-10 is a heavy drain on the public exchequer. In the absence of large-scale industry and lack of a strong tertiary set-up, the economy of the state continues to remain mainly agrarian. Thus about 40 per cent of the population is directly dependent on agriculture contributing 34% of the state income. To improve the state’s financial health, the government imposed high mandi taxes made to be borne by the buyers of farm produce. It includes 5% of VAT, 2 % as market fee, 2% as the rural development cess and 3% as the infrastructure cess. Another 2.5% commission ad valorem is borne by the procurement agencies. This commission increased with every successive change of state government i.e. from 1.5% to 2% in 2002 and then to 2.5% in 2007. Thus the commission agents thrived on three counts viz. increase in production and still faster increase in marketed surpluses, increase in market prices of farm products and commission on value of produce. Similarly, the earnings of the state government touched Rs 3,840 crore due to mandi taxes and commission agents’ earnings are estimated at Rs 600 crore from wheat and paddy marketing only. The evidence of substantial economic gains of the Green Revolution to farmers has been authenticated by various studies. Numerous agro-industrial and commercial concerns are some other direct beneficiaries of such development. For instance, cotton-based industries, rice shellers, flour mills, dal mills, fruit and vegetable processing units, cold storage, milk plants, sugar processing and alcoholic industry, oil mills etc have progressed on availability of raw materials. The increased demand for farm inputs led to the expansion of business concerns dealing with fertilizers, seed, feed, farm machinery, pesticides etc. A number of export houses also thrived on agricultural surpluses. Let us not forget the contribution of research and development for such a gigantic economic uplift of all sections of society. Now, that the state agricultural universities are facing a serious financial crisis, carping critics, sour skeptics and professional pessimists commonly argue with the comment that the pace of agricultural research output has slowed down and is not coming up to the expectations. The expectation is that every year wonders of the type of the Green Revolution should be generated. Such comments are uncalled for because the incremental output of subsequent research diminishes as the ecological concerns are getting stronger hurdles to cross. Notwithstanding these facts, severe questions about the rationale of funding of research are raised. To educate the general public, especially to those who are at the helm of affairs, there is perhaps need to have a strong socio-economic cell to examine the return to research in respect of cost involved to bring out the innovations and rapid adoption on one hand and spell out their contribution to society on the other. To quote an example, an analysis of PBW343 variety released in 1995 by Punjab Agricultural University was traced in terms of direct farm-level benefits from enhanced yield over the replaced HD2329 variety in Punjab and its neighbouring states without going in for secondary and tertiary impacts. It is startling to note that the net gain of only this one technology during the first decade of its inception was estimated at Rs 3350 crore, which was good enough to offset the entire budget of Punjab Agricultural University for four decades. The net indirect impact to other sections of the population, if traced, may be a multiple of this figure. There are a number of such glaring instances of technological innovation due to which significant benefits have percolated to society. Therefore, we must not lose sight of the fact that human factor is of immense importance for the long-term socio-economic growth of the country. During the past couple of years, even the national expenditure on research and development (R&D) has continued to be 0.85 per cent of the gross domestic product, out of which almost 13% goes to the agricultural sector. In the event of fast-rising demand for basic necessary farm products, agricultural research is a vital input for planned growth and sustainable development of agriculture in the country. The Indian Council of Agricultural Research, being an apex scientific organisation at the national level, plays a crucial role in promoting and accelerating the use of science and technology relating to agricultural research and education. There are 43 state agricultural universities in India. The mandate of these institutions revolves around providing research, teaching and extension services. The broad break-up of the budget allocation is that about 63% is allocated for research, 19% for teaching, 10% for extension and 8% for administrative and miscellaneous activities. The pitiable situation of these institutions can be viewed from heads of expenditure which state that about 88% of the budget goes to salaries and allowances while only 11.3% goes to contingencies and wages and less than 0.5% goes to traveling allowances. A cursory look at the overall expenditure budget of the five universities — Punjab Agricultural University and Guru Angad Dev Veterinary and Animal Sciences University in Punjab, Haryana Agricultural University and GSK Himachal Pradesh Krishi Vishav Vidyalya and Dr Y.S. 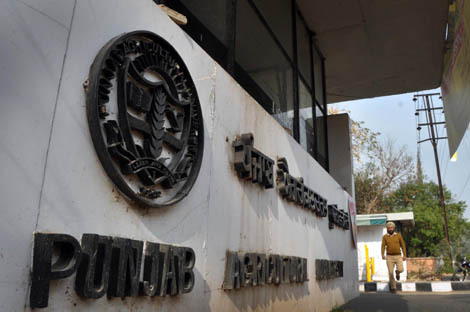 Parmar University of Horticulture & Forestry for the year 2009-10 was Rs 608.4 crore as against Rs 415.8 crore in 2005-06, showing an increase of 46% in four years, almost matching the rate of inflation, which means no real increase. Of this, almost three-fourth is contributed by state governments, 18% comes from the ICAR and the rest 8% from other sources. IT is high time we realised the importance of agricultural research in broader and long-term perspective. The state governments, commission agents, agro-processing industry, traders particularly exporters and farmers are the major beneficiaries of such institutional research. The earnings of the state government from the mandi taxes should partly be diverted for funding research and development. A part of the escalated income of commission agents must also be allocated to research. A small cut on farmers’ income at the market level is desirable. A small tax on the export of basmati and other farm products is also justified. Liberal project-based funding by agro-industries as a part of corporate social responsibility can further ease the funding position of agricultural universities.